Say hello to another nifty new website from Blue’s ArtHouse. This one is for long-time Old Town Florissant business, Florissant Glass. They’ve been providing and installing glass for residential, commercial, and auto since 1972. They know their glass! 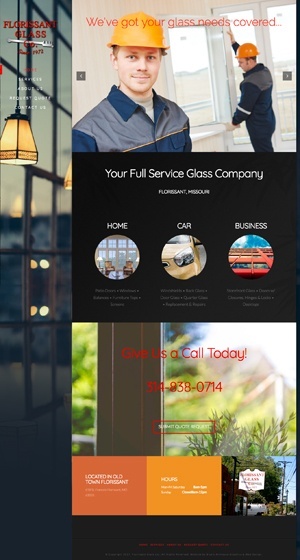 Florissant Glass is family owned and operated by the good Ortwig family and they’ll take great care of any glass service you may need for your home, your business or your car. For their new website, we used a flashy side navigation theme (yes sidebars are back in style!) and a lot of beautiful rich imagery of, you guessed it, GLASS!